Abertawe Bro Morgannwg University Health Board consists of the former Local Health Boards (LHBs) for Swansea, Neath Port Talbot and Bridgend and also the Abertawe Bro Morgannwg University NHS Trust. The Health Board covers a population of approximately 500,000 people and has a budget of £1.3 billion. The Health Board employs approximately 16,000 members of staff, 70% of whom are involved in direct patient care. 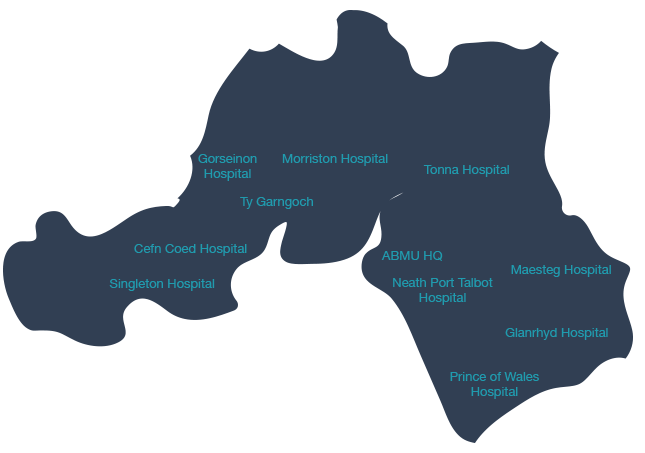 The Health Board has four acute hospitals providing a range of services; these are Singleton and Morriston Hospitals in Swansea, Neath Port Talbot Hospital in Port Talbot and the Princess of Wales Hospital in Bridgend. There are a number of smaller community hospitals primary care resource centres providing important clinical services to our residents outside of the four main acute hospital settings. There are more than 300 General Practitioners, around 275 dentists, 125 Community Pharmacies and 60 Optometry premises across the Health Board. General Medical Services within Her Majesty’s Prison Swansea are also provided via ABM. Christine chairs the ABM UHB Eye Care Group which meets on a regular basis. This health board runs an Eyecare Collaborative Group regularly and representatives from the ROC attend these meetings.